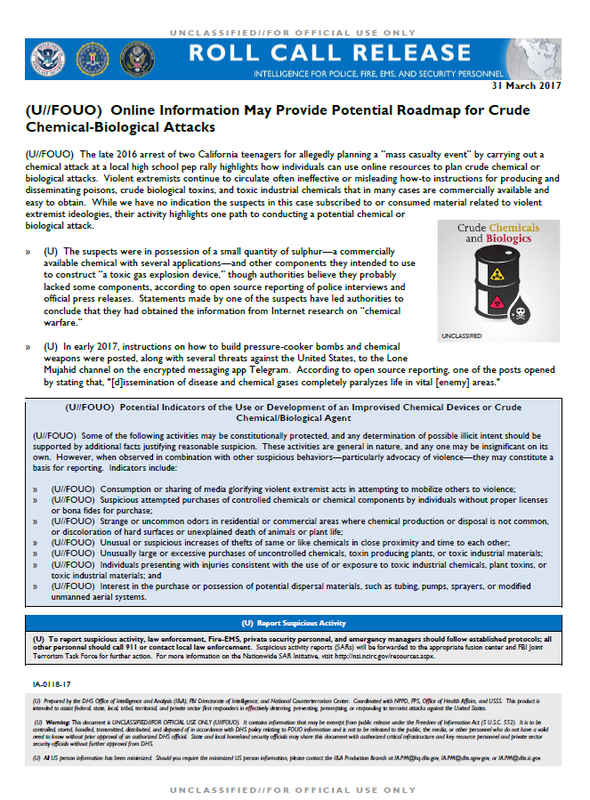 (U//FOUO) The late 2016 arrest of two California teenagers for allegedly planning a “mass casualty event” by carrying out a chemical attack at a local high school pep rally highlights how individuals can use online resources to plan crude chemical or biological attacks. Violent extremists continue to circulate often ineffective or misleading how-to instructions for producing and disseminating poisons, crude biological toxins, and toxic industrial chemicals that in many cases are commercially available and easy to obtain. While we have no indication the suspects in this case subscribed to or consumed material related to violent extremist ideologies, their activity highlights one path to conducting a potential chemical or biological attack. » (U//FOUO) Interest in the purchase or possession of potential dispersal materials, such as tubing, pumps, sprayers, or modified unmanned aerial systems.